For the full story about Big Picture Farm of Townsend, VT, check out our interview with owner Louisa Conrad. This is a product review of their goat milk caramel. We had noticed a trend at the recent Fancy Food Show in NYC. There were several goat milk caramel purveyors, but of all the ones that we sampled, these were our favorite. 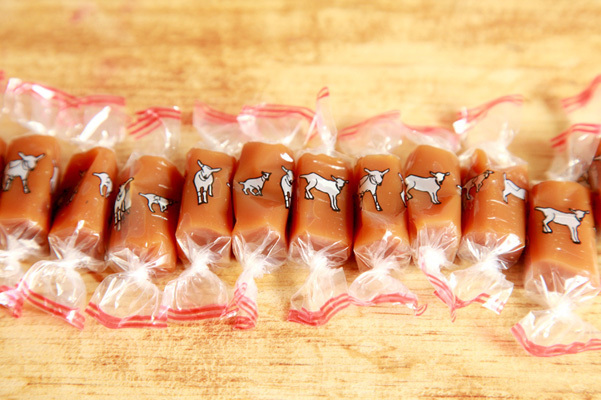 They have a sophisticated flavor from the goat milk that sets them apart from caramels you might have tried before. The goats graze on the southern Vermont flora from wildflowers to berries, and fall foliage from apple and oak trees to saplings of white pine and hemlock. All of this variation yields what the company calls “exceptionally floral and creamy milk.” It certainly makes their product unique. Right now their flavor line-up includes Original (with a hint of salt and vanilla), Chai, Maple and Cocoa Latte, but according to Louisa, she might be developing new products this winter. What appealed to us were the unique flavor profiles, although we were particularly partial to the Original, and the texture, which gives your teeth something to sink into, without removing any teeth. 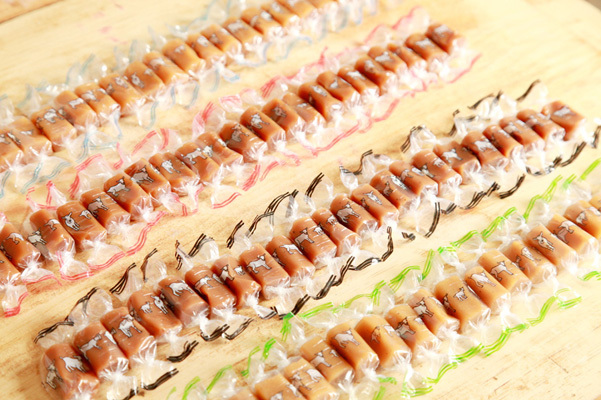 Some caramels seem to fight you. These don’t. They go down nice and smooth, with a bit of a chew and a faint goat milk flavor. If you weren’t told these were made from goat milk, we don’t think you would know. You would just take a bit and say, yes, that’s an elegant candy. You can purchase through their site or look for them in local Whole Foods stores or specialty cheese stores.